Added on October 18, 2018 by Ellen Halloran. A friend brought me a gift of grape leaves after visiting her daughter and future son-in-law in Salt Lake City. This accordion book forms a bridge between receiving that gift of fresh and vibrant grape leaves and my desire to perpetuate, materialize, and share that experience of beauty with others. It began with a perception of beauty in the leaves, apparent to my eyes, a moment that lingered in my mind even as the leaves grew limp and withered. I wanted to share that insight with others and move it from the realm of my inner thoughts into physical, three-dimensional form. The materials of paper, cardboard, ink, paint, and the leaves themselves, form a bridge that seeks to access that beauty even after it has faded from the physical realm. It brings the viewer both backward to the original gift and forward to a new moment of apprehension. My friend’s gift of grape leaves, carried eastward from Salt Lake City to the island of Manhattan, inspired and generated this gift; it created a bridge of time, of relationship, and of enduring beauty. This work is now on view at Our Savior’s Atonement Lutheran Church, 178 Bennett Avenue, in Washington Heights, NYC as part of their “building Bridges” art show. Added on August 2, 2018 by Ellen Halloran. 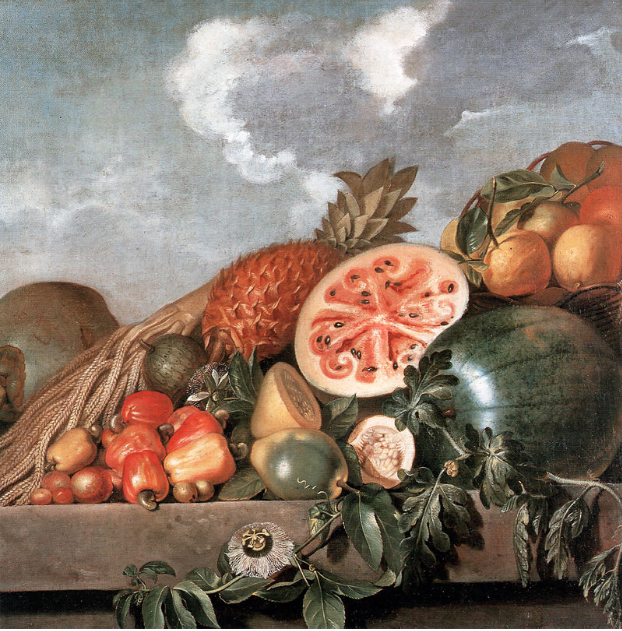 August 3rd is National Watermelon Day and I've chosen a few art works, including one of my own, to mark this unofficial food holiday. Added on February 22, 2018 by Ellen Halloran. 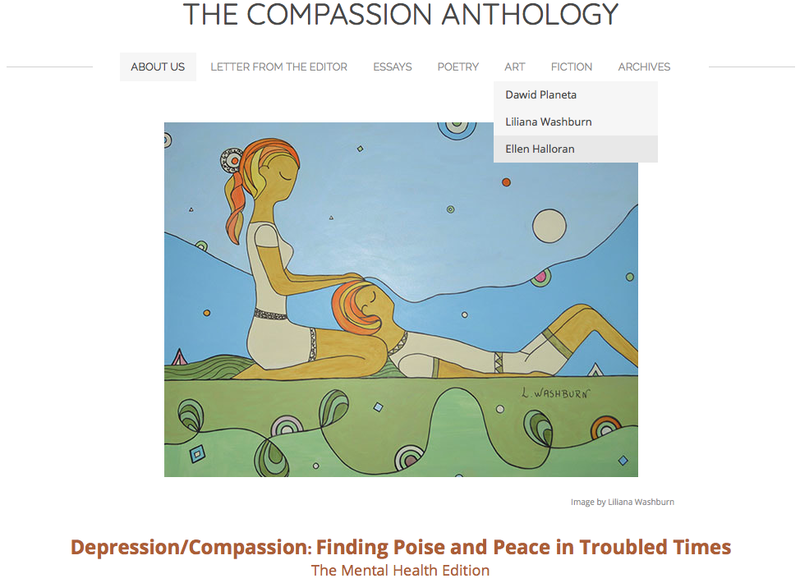 The Winter 2018 issue of The Compassion Anthology contains my essay on compassion and the artist. This essay is my answer to the question "Do artists show compassion to themselves when they create works of art?" Compassion is defined as a sympathetic consciousness of others’ distress and sorrow accompanied by a desire to relieve that suffering. It can refer to both the understanding of another’s pain and the action that stems from that feeling. Does an artist offer compassion to herself/himself in the process of creating a work of art? How does an artist’s work begin? We have an idea that appears in our mind, something with a life of its own that wants to be realized in the material world. We may have a feeling of apprehension. Can we fully and worthily realize this idea that wants to come forth? Avoidance brings us to a state of intellectual paralysis, to a sense of being locked inside of ourselves as the idea searches for a material existence. Some artists speak of being “blocked,” of feeling depressed. Other artists experience this as a kind of anxiety. Movement unlocks our feeling of helplessness. We move from an idea to a finished form by simple actions—picking up a pencil, making a mark, tearing a sheet of paper, executing a brushstroke, joining surfaces together—until what was once only a thought achieves a palpable existence in the material world. Flannery O’Connor wrote that in art the self, (the artist) becomes “self-forgetful” to facilitate the demands of the ideas that we see in our minds and the things that we actually create from those ideas. In this self-forgetfulness artists act compassionately toward themselves by keeping their ideas in motion, alleviating their own anxieties, and bringing them forward as gifts to the world in lyrical, energetic and beautiful forms. Ellen Halloran is a visual artist working in several media. She has worked as a metalsmith, jeweler, legal proofreader, art teacher and art therapist. She developed and implemented art programs for child victims of sexual abuse, children who witnessed violence, and children recovering from traumatic events. Her work has been seen in galleries and is in many private collections. Added on December 15, 2017 by Ellen Halloran. Added on November 26, 2017 by Ellen Halloran. RE-Formation:Moon and Moth will soon be going to a new home. It will travel in a custom-made slipcase of archival quality board. Added on October 9, 2017 by Ellen Halloran. I think of "reformation" as change, transformation, a state of transition and even as metamorphosis. Materials themselves provide me with ideas. The fabrics of this work inspired me as I changed disposable cardboard packaging, something that is usually tossed without a glance or hesitation, into an object to be considered with joy and wonder. 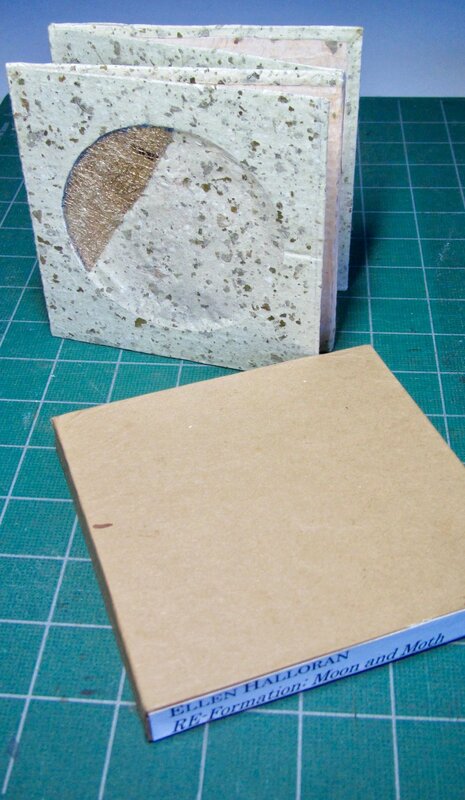 I covered it with handmade papers that contain fragments of leaves and plant fibers. The pre-cut circles in the cardboard seemed like windows through which the constantly changing moon can be seen. I thought of moths seeking light at the time of the new moon and I remembered that a friend had given me some pieces of moth cocoon, traces of a very real metamorphosis. All of the materials here have gone through changes, have been re-formed. 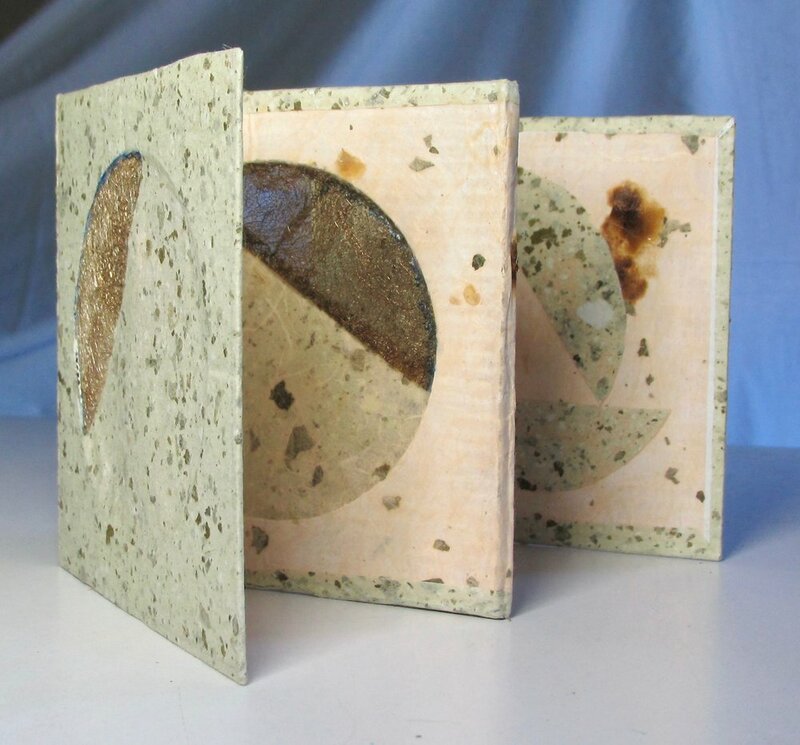 Trees and plants and insects have been changed into a small book that I have named "RE-Formation:Moon and Moths." Our Saviour's Atonement Church in Washington Heights , NYC is sponsoring a Reformation-themed show opening on Saturday, October 14, 2017. Added on May 5, 2017 by Ellen Halloran. If you missed the opportunity to purchase an artist-donated postcard in the gallery show you can now purchase a book with photos of all the postcards in the show. Artist's names, location, and websites are included along with images of the front and back of each postcard. All proceeds from the sale of the book and donated postcards go to Save the Children Syria. Added on March 31, 2017 by Ellen Halloran. 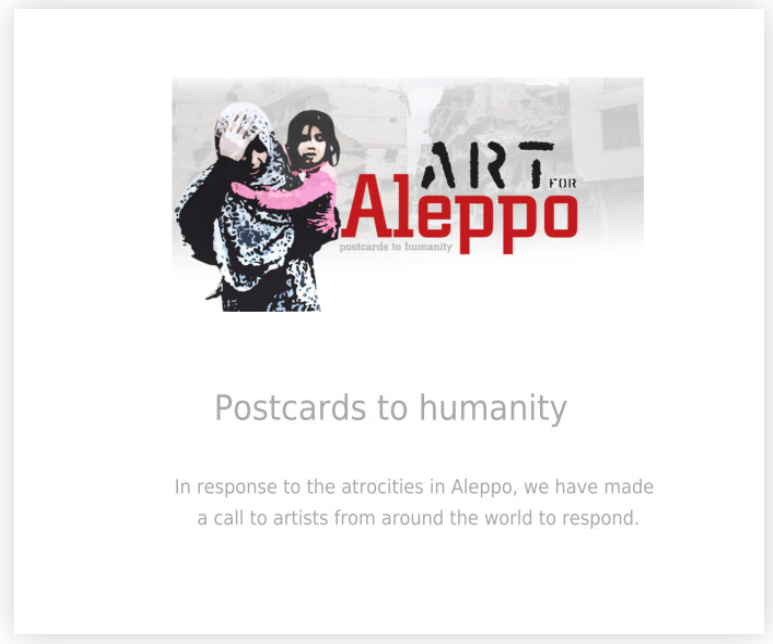 A wide array of national and international artists have donated their work to help provide aid to the children of war-torn Syria. Your donation of $25 will purchase an original work of art and 100% of the proceeds will go directly to provide Syrian children with emergency care, food, and water. A reception and fundraiser will be held on Saturday, April 22 from 5:00pm to 9:00pm at Catalyst Gallery, 137 Main Street, Beacon, NY. Added on August 11, 2016 by Ellen Halloran. A.I.R. Gallery is proud to be partnering with Interstate Projects for our 15th annual POSTCARD SHOW! This pop-up event is 3 DAYS ONLY and will feature hundreds of affordable works by artists from all over the world. All proceeds go to benefit A.I.R. programming. Join us for this crazy fun feminist event! Music, drinks, affordable art by your favorite artists & more! Invite your friends, family, feminists and everyone you know! It's our way of saying THANKS to all of our wonderful supporters who make A.I.R. a thriving voice in the art world. A.I.R. is supported in part by the New York Department of Cultural Affairs and The Lily Auchincloss Foundation. Private foundations include: The Milton and Sally Avery Arts Foundation, The Bernheim Foundation, PGS Millwork, The Scalapino O-Books Fund, The Segue Foundation, Inc., and from individual donations. Added on July 6, 2016 by Ellen Halloran. Here you will find some experimental drawings from a few years ago. Go to lunchticket.org and find the Summer/Fall 2016 issue. Under Art in the Table of Contents look for drawings of barn owls. Added on June 18, 2016 by Ellen Halloran. Here's a gift from a garden. Added on May 28, 2016 by Ellen Halloran. The Manhattan Solstice, or Manhattanhenge, occurs when the sun aligns with the east-west street grid of the New York City island. It happens four times each year, on dates that are evenly spaced before and after the solstice. Best enjoyed from one of the wide cross streets, viewers can see a setting half sun tonight; tomorrow they will see a full sun setting across the urban canyon. Similar spectacles will occur July 11th and 12th. In winter there is an inverse Manhattanhenge. The rising sun aligns with the street grid on dates spaced around the winter solstice; approximately December 5th and January 4th. Added on April 3, 2016 by Ellen Halloran. The female red-winged blackbird is often overlooked because of her earthy, brownish feathering. This subtle coloring works well as a camouflage in concealing a nesting female bird. The dictionary I use defines 'brown' as "any of a group of colors between red and yellow in hue, of medium to low lightness, and of moderate to low saturation." This female red-winged blackbird has beautiful reddish-yellow highlights amid various shades and tints of brown. Here's the more well-known and easily identified male of the species. Scarlet feathers on his shoulders. Added on December 24, 2015 by Ellen Halloran. It's the first Christmas full moon since 1977 and a very hazy one at that! Added on December 11, 2015 by Ellen Halloran. Exhibition for Children at Risk! Purchase Art Online and Support Children at Risk! We will email you to confirm availability and reserve art for you. Then proceed online to make payment. If you do not see the blue ENTER button, please refresh your browser. Choose from an outstanding selection! photographs by more than 200 established and emerging artists. Each work of art is on sale for a minimum donation of $125 each. All artwork is available on a first come, first serve basis. Help empower children with the gift of art! Art in a Box assists children and young artists around the world who are in need, disadvantaged by poverty, or who are facing crisis situations due to war, public health emergencies, or natural disasters, and supports their recovery and empowerment through art and art education. Art in a Box is a 501(c)(3) tax-exempt, nonprofit organization. Added on December 9, 2015 by Ellen Halloran. (Purchase Art Online for $125 and Support Children at Risk! Here's how to reserve art and make your donation online. artist you wish to collect, your name, and your contact information. 2. Make your donation and pay by credit card online through PayPal. "last name of the artist". Please share this offer with your friends, collectors and social media! Added on December 8, 2015 by Ellen Halloran. COME BACK TO PURCHASE ART ONLINE! Added on November 16, 2015 by Ellen Halloran. Added on October 24, 2015 by Ellen Halloran. Jan Lievens, a Dutch painter, son of a tapestry worker, was born on October 24, 1607. He began a formal study of art at the age of eight and two years later was formally apprenticed to Pieter Lastman. Lievens was working as an independent artist at the age of twelve. This early display of talent made him a celebrity and brought him attention from influential political figures. From 1626 to 1631 Lievens collaborated with Rembrandt van Rijn, sharing models, subject matter, and possibly a studio. Lievens painted several portraits of Rembrandt. His work has often been confused with that of Rembrandt; it was only in the twentieth century that "The Feast of Esther," long attributed to Rembrandt, was finally determined to be the work of Lievens. North Carolina Museum of Art, Raleigh, North Carolina, U.S.A.
Lievens subjects range from formal portraits to character studies, classical mythology, Biblical scenes, and landscapes. At the age of 31 Lievens was invited to the British court. Later, he served as a court painter in The Hague and in Berlin. He returned to Amsterdam in 1655 and died there in 1672.